It’s every car lover’s fantasy: the perfectly preserved classic automobile discovered under a blanket in some great-granny’s garage. And as author Tom Cotter has discovered time and again, it’s a fantasy that can come true. The Hemi in the Barn offers more than forty stories of amazing finds and automotive resurrections. Avid collectors big and small recall the thrills of the hunt, the tips and hunches followed, clues pursued, the heart-stopping payoff. There’s the forgotten Duesenberg—probably one of the last unrestored ones around—that Jay Leno found in a Burbank garage. Unbelievably, Leno found another Duesenberg in a parking garage in New York City—a car that was parked in 1933 and never moved. There’s a Plymouth Superbird found buried in a hedge in Alabama. There’s the rescue of the first 1955 Corvette ever built. 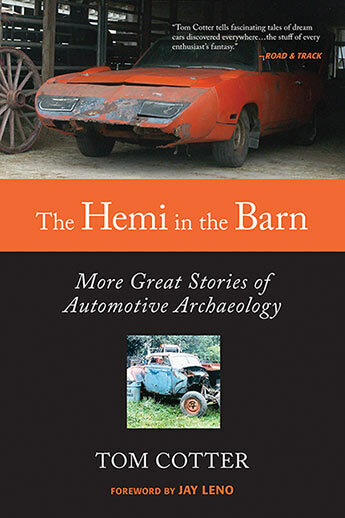 As entertaining as these tales are, they’re also full of tantalizing hints and suggestions for readers setting off on their own adventures in automotive archaeology.